One of the attributes which makes Google great has to be its whimsical sense of humor and fun. There are a plethora of Easter eggs for Google's services and products (see more below) but this latest surprise will have you fighting an impossible battle to save your search results. 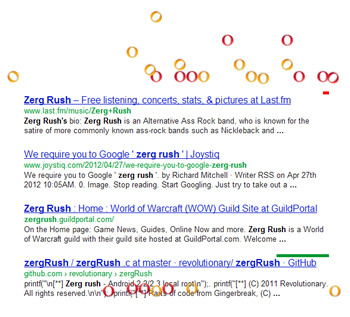 When a user Googles "zerg rush", a swarm of enemies shaped like the letter "O" will begin to fall from the top of their browser window. Users will only have moments between each wave to fight off the invasion by furiously clicking each O. Once your page results have been obliterated by O-shaped invaders, a couple of Gs will appear and score your valor and sacrifice. For those willing to participate, users can even post their score to Google+. The loneliest number? It's 1, of course!